Our Texas buddy Todd -- well, he was in Portland for a year, now in Cleveland -- is becoming quite the beer geek, despite claiming an allergy to hops. First he goes to Boston and attends the American Craft Beer Fest; then he shows up on my doorstep with an armload of hard-to-find beers from Russian River and Port Brewing's Lost Abbey, courtesy of his friend Andy in LA. Lindsey and Amy threw their traditional July 4th party, and Brett provided an excellent home-brewed Kolsch. The two five-gallon cans of it were exhausted in record time, which gave us an excuse to crack open Todd's bottle of barrel-aged Isabelle Proximus. 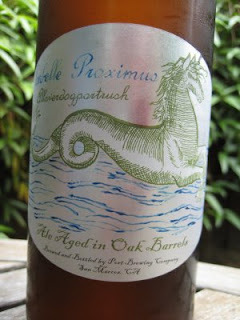 Isabelle Proximus is not simply a Lost Abbey product, but as the label says, an "Allaverdogportrush" ale -- a collaboration between five rock star brewmasters from Allagash, Avery, Dogfish Head, Port Brewing, and Russian River. Rob Tod, Adam Avery, Sam Calagione, Tomme Arthur, and Vinnie Cilurzo, respectively. Whew! That's some lineup. But from the outset there were two things working against this beer for me: first, it's a recently-released bottle-conditioned ale that most aficionados would cellar for awhile before opening; second, with its combination of wild yeasts and other fermenting beasties, it's going to be intensely sour. I reserve the right to one day acquire a taste for sour beers, but it hasn't happened yet. We shared it around in one or two glasses; it looked right in a Saison Dupont glass that Lindsey had, more or less the same light-golden color as a saison. And, not surprisingly, it was extremely sour, so much so that I can't think of any other description of the flavor. There were no spoiled or medicinal flavors; it wasn't cloying; no hop or fruit flavor... just tartness. It was a big hit with sour-Belgian fans like Corey and Adam, who intoned in solemn Mayor Quimby voices "This is a fine bee-yuh." That is, if intoning is something you do over and over. One interesting insight was from Tave, who I've known since we were both in the Peace Corps years ago in the West African country of Mali. "It's like dolo," she said -- traditional Malian millet beer. When I've tried to explain millet beer to people, I usually compare it to Bavarian hefeweizens: cloudy and yeasty, a little tart. But Tave is onto something by associating it with sour Belgian-style ale: dolo is fermented in open cauldrons, so at least some of its fermentation is likely due to wild yeasts. You drink it fresh, at room temperature -- which is admittedly somewhat higher than the temperature of a Belgian cellar -- and there are assuredly no hops in it. So there you go -- some people pay $40 for a bottle of aged sour beer, some people pay a few cents for a fresh gourd of it. If you like a well-made wild ale that is going to age well for many years, Isabelle Proximus is for you. It's not really my cup of tea, but I sure am glad to have gotten a taste of a beer with such an interesting parentage. Salut to Todd and to Andy for generously providing the bottle! Wow, that's a helluva thing.